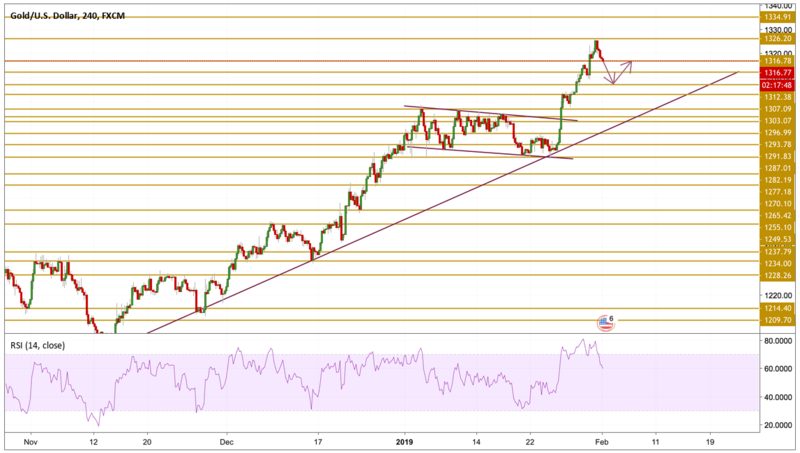 The correction in Gold prices from 9-months highs of $1326.15, stalled and the rate entered in a consolidation at near support levels ahead of highly anticipated US employment data release to make the next move. The yellow metal keeps its range relatively near the highest levels since April 2018 due to the aggressively dovish tone delivered by the Fed on its rate hikes. However, the latest leg down in the commodity can be mainly attributed to the renewed risk-on trades seen on global equities following some progress in trade talks between the US and China. Gold prices went for another run and printed a new high of $1326.15 per ounce and then retreated back towards support levels. The correction came amid a divergence between the momentum and the price alongside profit taking after an incredible surge in prices. We expect the price to correct more before we expect the bulls to take control again. The next level we will be watching is the $1307.07 level.